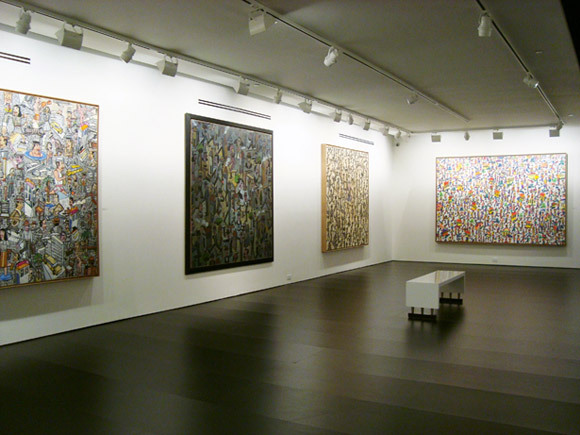 Installation shot of Antonio Seguí: A Retrospective Exhibition 1966–2010. A retrospective exhibition spanning over 44 years by post-modernist Antonio Seguí will be on view at Nohra Haime Gallery from April 27th through June 30th. Antonio Seguí’s fascination with the city, its people and its movement has been a part of his work for the past three decades. The artist, in a pre-computer age, has created a vocabulary now being explored by a new generation of artists through comics and Manga. Often described as the painter of cities, Seguí pulls inspiration from the modern-day man—urban, fast-paced and intense. Noticeably repeated throughout many of Seguí’s compositions is the automaton, his version of the “everyman,” the faceless passerby and the anonymous being that serves as a fleeting thought. Up close the figure is an individual, walking down dark alleys, pointing, waving, and emerging from potholes. But at a distance, the individual morphs into a complex pattern swallowed up in a labyrinth of buildings and cookie-cutter trees. Seguí’s perfectly duplicated images mimic those that are computer generated, but ironically, he adopted this style well before computer technology became mainstream. Seguí’s visual language and social commentaries are more poignant today, both symbolically and literally, than when they first started appearing in his work. He often explores man’s place in society with scribbled words referencing current events that act as a ground for the “everyman” to tread upon. Antonio Seguí began his artistic endeavors at a young age when he left Argentina to travel the world and study art. Places like Latin America, Europe and Africa exposed him to new ideas and encouraged his culturally diverse approach to art. Seguí, who started as a conceptual artist, was later influenced by artists like Fernand Leger and Diego Rivera. His work is generally satirical, critiquing society and human nature. Born in Córdoba, Argentina in 1934, Antonio Seguí currently lives and works in Paris. He studied at the San Fernando Academy in Madrid, Spain as well as the Ecole des Beaux-Arts in Paris, France. His first solo exhibition was in Argentina at age 23. Seguí’s work is collected and exhibited worldwide in places such as the MoMA, New York; Art Museum of the Americas, Washington, DC; Frissiras Museum, Athens, Greece; Museo de Arte Moderno de Buenos Aires, Buenos Aires, Argentina; Museum der Moderne Salzburg, Salzburg, Austria; Museum of Modern Art Dubrovnik, Dubrovnik, Croatia; and Museo Tamayo, Mexico City, Mexico. The Musée National d´Art Moderne, Paris organized a retrospective of his works on paper in 2005. A monography of his work was written by Daniel Abadie in 2010.